Hi @shintoplasm01, most probably some of them will be backported, but if you want to have more detailed reply, you should ask one the Opera's employees, e.g. @tnowak, or @mgeffro. - DNA-73421 Speed Dial background flickering, while changing themes. - DNA-75096 JS and invalid cert dialogs are not visible after tab switch. - DNA-75140 [Mac] Video entering/exiting full-screen mode takes a long time. - DNA-75185 Zoom pop-up is shown, when the page is not displayed in the default zoom level, and when choosing “Print”. "Today we are releasing the developer version of the new Opera browser (v.59), codenamed R3 (Reborn 3). In each of our Reborn releases, we seek to redefine the modern browser, both in terms of look and functionality. We are extremely excited, that R3 will be the world’s first Web 3-ready desktop browser. Today however, we would like to discuss the upgrades to the design of the browser interface, that enhance the user’s browsing experience. With R3, we put Web content at center stage. We’ve removed dividing lines between sections, so you can browse without borders and unhindered by unnecessary distractions. Also, just as no one frame is effective for every picture or in every lighting, we’ve given the browser two distinct themes - light and dark. The design of each of these themes was inspired by high-key and low-key lighting photography, where the goals are to maximize or minimize the amount of light in a photo, while still retaining contrast. Depending on your mood, your setting, or the content you are viewing, you are in control of how you frame it. There is no other browser, that comes close to Opera in terms of features and functionality, and we didn’t intend to make any compromises. What we’ve done with R3, is to refine our features and place them in a way, that they are fully accessible without getting in your way. Our vision of minimalism, is such that your browser is more functional for your daily use, not less. We’ve achieved this in very specific ways. We’ve given the browser a fresh new look, and moved some of its key functionalities, so that there is nothing to distract you from your content. 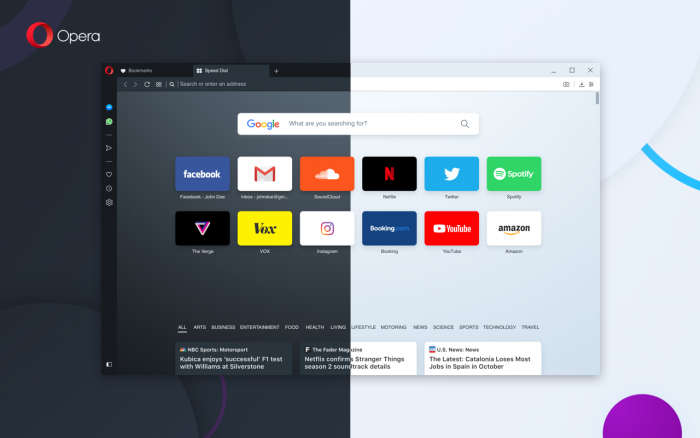 The new tabs have been designed to elicit a visceral response - whichever tab you have open, it feels physically open, and stays on top of other tabs. After thorough testing, we have also decided to move EasySetup and Snapshot to the access bar, where they are better placed for convenient access. 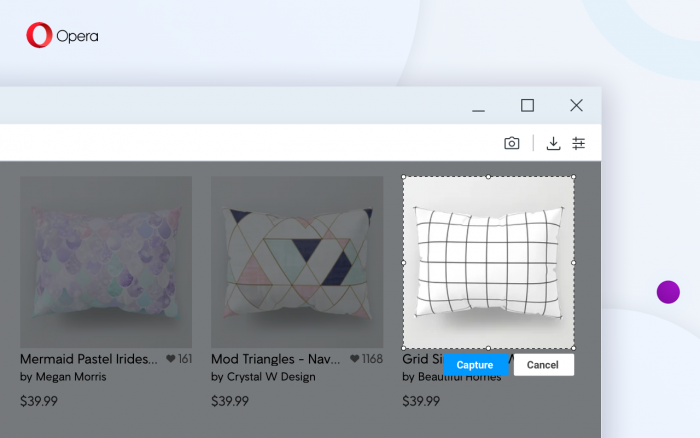 The Snapshot tool, which lets you take screenshots of a website, has been placed next to other web browsing functionalities, such as “Send to My Flow” and bookmarks. This means, that now all the key interactions you can have with a website, such as adding it to bookmarks, sending it to your “Flow”, or taking a screenshot are in one place. The EasySetup panel has been moved from the browser’s start page to the toolbar area, to keep the browser’s basic settings at hand. 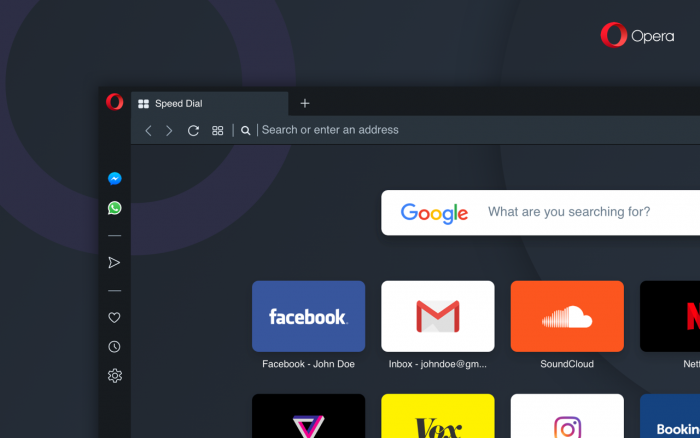 This makes it easier for you to adjust the theme, wallpaper, and switch on some of Opera’s crucial features, while you browse. Our brand new browser also features integrated Crypto Wallet, which lets you browse Web 3, while signing crypto-transactions with your phone. To use it, you have to pair the crypto wallet in Opera for computers with your Opera for Android browser. We hope you enjoy the design changes in our new browser. 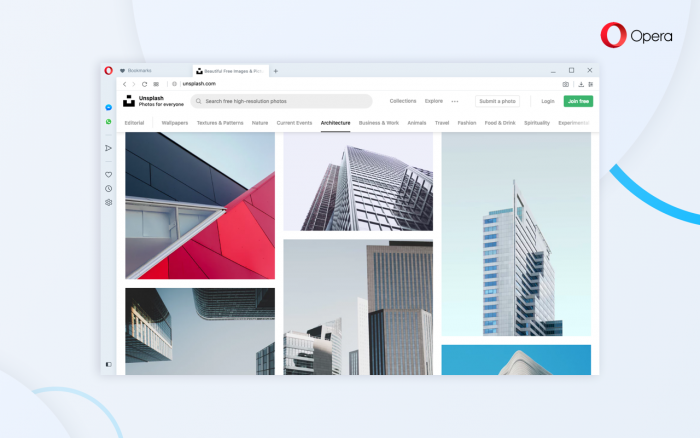 We will let you know more about how R3 defines the new standard of browsing through features in the blog post on our browser’s launch day in March. To get the latest updates from our team, make sure to visit our Reborn 3 page and sign up there." 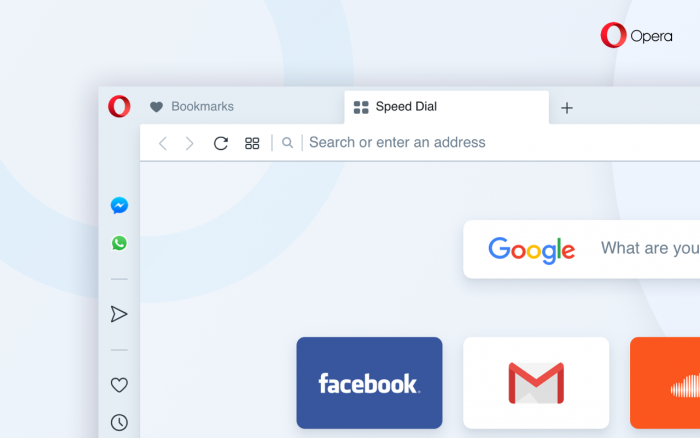 There's also small change to the sidebar: from now on, if your sidebar is unpinned, it won’t be visible on the browser’s internal pages including Speed Dial. You can change it’s visibility in Easy setup. With the new version of Opera developer I can't seem to divide the Speed Dial into files of 5 websites. Previously I did that with Zoom, but now the zoom changes between 250% (4 websites) to 300 (6 websites). I would like an 275% (5 websites? ), How I can do that? Can you fix it please? When you turn on the dark theme, the sync window is still light. Hi @sencor90, @donq, @temkem, this is the first build, that includes a new redesign. Some parts of the UI, and other things are not implemented completely, e.g. white background of the pop-up window in the dark mode. It should be in one of the further versions. Hi @devoncito, it's known issue, it should be improved in one of the next builds. Are you ever going to fix the double ampersand in bookmarks bar bug?